In a recent paper, we test the bank lending channel of monetary policy in developing countries using Uganda as a laboratory for identification (Abuka et al. 2017). Uganda is a fast-growing East African economy which experienced largely unanticipated variation in monetary policy during our period of analysis (2010–2014). Between the second half of 2010 and June 2014, monetary conditions ranged from highly contractionary to highly expansionary. In the second half of 2011, the Bank of Uganda raised the policy rate by a cumulative 1,000 basis points (bps).2 This monetary tightening followed inflationary pressures from a large commodity price shock. After the tightening of monetary policy, the economy slowed down and the Bank of Uganda gradually cut the policy rate by a total of 1,100 bps. These developments are illustrated in Figure 1, which shows year-on-year credit growth soaring to more than 30% in early 2011. Following the tightening, credit growth collapsed to negative levels by the second half of 2012. While the chart illustrates a strong negative association between credit and the short-term interest rate, the key empirical challenge is to isolate changes in loan supply from changes in loan demand, given that aggregate macroeconomic shocks affect bank credit through both the bank lending and the firm borrowing channels. To overcome this identification issue, we use a supervisory loan-level credit register which covers all corporate loans extended by banks in Uganda, including loan applications and rates, matched with bank balance sheets and regional macroeconomic indicators. The granularity of the data allows us to compare loans to firms in narrowly defined clusters (all firms in the same industry and district) borrowing in the same quarter from different banks. Alternatively, we compare loans to the same firm borrowing in the same period from different banks. We separate the effects of monetary policy, proxied by changes in short-term rates, from those of macroeconomic conditions by controlling for real GDP growth and inflation (as well as nominal exchange rate and terms of trade in robustness checks). Further, we allow the effects of monetary policy to vary with bank balance-sheet strength, in particular, leverage and exposure to government debt. We document a strong bank lending channel of monetary policy on the extensive and intensive margins of credit adjustment. A monetary policy tightening strongly reduces credit supply, increasing loan application rejections, reducing granted loan volume, and raising loan rates. An increase in short-term interest rates by one standard deviation (approximately 350 bps) reduces the likelihood of loan granting in the same quarter by 1.2–2.8 percentage points. Given a loan application rejection rate of 16.3%, these estimates imply a semi-elasticity of 7.4–17.2% decline in the likelihood of loan granting. An increase in short-term interest rates by one standard deviation reduces granted loan volumes by 10–20%. About half of the variation in market interest rates translates into changes in loan rates, indicating an economically significant pass-through. Additionally, we show that better capitalised banks transmit changes in monetary policy significantly less than thinly capitalised banks. This dampening effect could be due to the external finance premium for banks, according to which banks with stronger balance sheets benefit from better access to external funds, and hence are less sensitive to changes in monetary conditions (Bernanke 2007). This result has been documented before in the context of advanced economies. However, contrary to advanced economies (see Kashyap and Stein 2000 for the US, and Jimenez et al. 2012 for Europe), we find that banks with higher liquidity (mainly reflecting greater exposure to sovereign debt) react more – not less – to monetary policy changes. This amplifying effect is consistent with the notion that a monetary tightening leads highly-liquid banks to further invest in government securities at the expense of new lending to firms – a ‘crowding out’ effect. The bank lending channel of monetary policy is effective if short-term interest rates affect not only bank credit but also the real sector. We test for monetary policy transmission to consumer prices and real economic activity as proxied by night-time luminosity, building permits, trade, and public demonstrations, using Ugandan districts as the unit of analysis. The impact of monetary policy on inflation and the real sector is consistent with the results on loan supply. We find that inflation and real outcomes are less affected by a monetary policy tightening in districts where banks are less levered and less exposed to sovereign debt. We also show the bank lending channel is stronger in districts with greater financial development, consistent with the idea that more developed credit markets are a boon for monetary policy transmission. These findings emphasise the role of financial development in shaping the impact of public policies on the economy, supporting the notion of finance as a crucial input to capital accumulation and economic growth (Beck et al. 2000, Beck and Levine 2002). The conventional view is that monetary policy is ineffective in developing countries, largely because of weak institutions, underdeveloped financial markets, and uncompetitive banking systems. Our research challenges this view by putting forward a novel set of results that are based, for the first time, on micro data. We use a supervisory loan-level credit register coupled with extensive statistics on regional economic activity in a bank-dependent developing country. We contribute to the credit channel of monetary policy by analysing, for the first time, loan applications and rates, which allow us to disentangle demand and supply, and the effects on inflation, a crucial outcome for central banks. 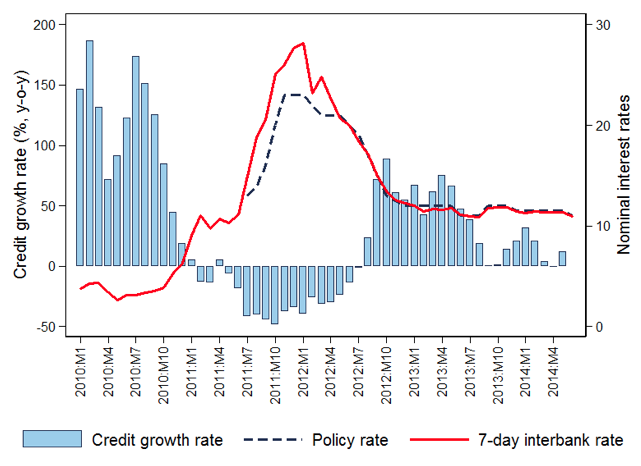 We find that monetary policy has strong effects on credit and economic activity. That said, there are important differences from advanced economies. First, more liquid banks enhance the impact of monetary policy on credit supply and the real economy, consistent with public debt crowding out private credit. Second, financial development strengthens the macroeconomic impact of monetary policy. Our results also reveal interesting effects of the bank lending channel on public demonstrations, which go beyond the typical modern study of monetary policy. Overall, our analysis emphasises the importance of banks and financial development for the effective implementation of macroeconomic policies in developing countries. Abuka, C, R Alinda, C Minoiu, A F Presbitero and J L Peydro (2017), “Monetary policy in a developing country: Loan applications and real effects”. Beck, T and R Levine (2002), “Industry growth and capital allocation: Does having a market- or bank-based system matter?”, Journal of Financial Economics 64: 147–180. Beck, T, R Levine and N Loayza (2000), “Finance and the sources of growth”, Journal of Financial Economics 58: 261–300. Beck, T, M Fuchs and M Uy (2009), “Finance in Africa – Achievements and challenges”, VoxEU, 20 July. Beck, T (2009), “Financing Africa: New hopes and continuous challenges”, VoxEU, 16 September. Bernanke, B (2007), “The financial accelerator and the credit channel”, Speech delivered at the Board of Governors of the US Federal System, Washington DC, 15 June. Jiménez, G, S Ongena, J Peydró and J Saurina (2012), “Credit supply and monetary policy: Identifying the bank-balance sheet channel with loan applications”, American Economic Review 102(5): 2121–2165. Kashyap, A K and J Stein (2000), “What do a million observations on banks say about the transmission of monetary policy?”, American Economic Review 90(3): 407–428. Mishra, P and P Montiel (2013), “How effective is monetary transmission in developing countries? A survey of the empirical evidence”, Economic Systems 37(2): 187–216. Mishra and Montiel (2013) argue that the weak monetary transmission identified by prior studies on developing countries is the result of structural impediments, including shallow financial markets, weak contracting environment, and limited competition in the banking sector. In addition, they point out methodological deficiencies that plague the literature, in particular the heavy use of vector autoregressions and cross-country regressions on aggregate data. In July 2011, the Bank of Uganda also moved from a monetary aggregate targeting framework to an inflation targeting monetary policy framework and introduced a policy rate to signal the monetary policy stance. The monetary policy tightening event could be considered largely unanticipated, as the Bank of Uganda had a dovish track record. Monetary policy remained highly accommodative during earlier episodes of high credit growth and inflation and, before the mid-2011 tightening, the Bank of Uganda explicitly stated the need for the monetary authority to support strong economic activity rather than to address inflationary concerns.